I happened across a blog post by Infowars that gave 25 “facts” about the Federal Reserve that everyone should know about. Taking a quick glance I saw how absolutely uninformed this list was. I decided to take a moment to go through this list and show you how little the Infowars/conspracy people actually know about the state bank. In multiple places I point out how other central banks do not behave or work the same way the Federal Reserve does. The reason for this is because the Infowar/conspiracy people or libertarians believe that all central banks operate the same way. This is not true and important to mention when discussing the Fed itself. The period it is referring to is from the Civil War to 1913. In fact this is true. The problem is that its source doesn’t actually give a reason why it is attributable to there being no central bank. They are essentially making the correlation equals causation fallacy. Growth in capitalism slows down over time, its called stagnation, Marx wrote extensively about it as a part of economic theory. It was perfectly predictable from a Marxist view that this would happen. There has never been “a persistent, ongoing problem with inflation”. Inflation has a natural tendency to increase as economies increase in size. Several percent is not a “problem with inflation”, as it is not a problem. The only relevant moment in inflation was during the gas shortage in the 70s. This problem had nothing to do with the central bank; it was caused by a sudden increase in the cost of commodities due to a fuel shortage, which affected most of the production process. The same thing happened with currency between the Revolution and the creation of the fed. There is no link between this loss in value and the Federal Reserve. Besides it doesn’t mean anything as long as purchasing power rises faster than the loss in value. These two things aren’t inherently connected anyway. Yes. The Federal Reserve’s job is to help regulate finance due to the inherent instability of capitalism. When this regulation was written the richest most powerful people in finance had a vested interest in being a part of its creation. Obviously it is probably not a good idea to let them in on it, but the system is owned and operated by finance capital. No one else wields that much power. This is part of the class nature of the government and society we live in. This is no conspiracy, it is very obvious. This was very ignorant; the business cycle is an inherent feature of capitalism. They actually thought this would stop it. And? What is this supposed to mean? There is no demonstration that this is true. The point of the Federal Reserve is to regulate finance. It was many decades later those bailouts happened. There is no evidence whatsoever that those bailouts were planned from the beginning. The addition of the permanent income tax is not related to the creation of the Federal Resave. It costs money to run a government; they’re making a conspiracy out of it when there isn’t one. Correlation is not causation. The creation of both was in the works as a part of an economic overhaul. The Fed is not related to income tax. This is a very cheap attempt at claiming a conspiracy. #9If you can believe it, there have been 10 different economic recessions since 1950. The Federal Reserve created the “dotcom bubble”, the Federal Reserve created the “housing bubble” and now it has created the largest bond bubble in the history of the planet. Yea I can believe it; capitalism goes through cycles of boom and bust. The Federal Reserve did not create the “dotcom bubble” or the “housing bubble”. People and companies borrowing money investing in internet companies that went bust caused the “dotcom bubble”. Banks offering sub-prime mortgages based on the fact there had never been a massive crash of home values since the Great Depression caused the “housing bubble”. The Fed is not responsible for either of these events. Bad investing and the removal of regulation that was intended to combat this caused them. Blaming the Fed for this is absolutely downright stupid. 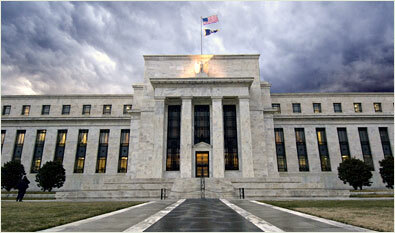 The Federal Reserve purchases assets from banks for that money; they don’t know how the Fed works. Of course they invested it that’s the point. The financial system is always unstable, more so now because regulation is not in place. Bankers, investors don’t learn from mistakes. The Fed create money in a capitalist system. Capitalism does what it does with it. This should be a criticism of capitalism not the central bank. Yes, this is actually true. The Federal Reserve does do this. This is because that while the quantitative easing is designed to repair the economy, the bank and government retain a class context which people like Infowars ignores. Yes, this most certainly has, but the post phrases it as though this must be the only that could happen because it is a central bank. This does not happen in socialist countries that have one. They are ignoring the class character of the Fed and the country. QE was created with the specific purpose of having the banks loan out that money. Instead the banks have kept the money and invested it. What has happened here is that capitalist banks have acted in a capitalist manner. The site Infowars makes it out to be some kind of conspiracy, it is not. This is the functioning of a system based on money as a source of power. Capitalists hold the power; they make the rules and have a system based on their benefit. This statement is true, however the post is claiming is as a fact of the Federal Reserve. There is no explanation as to why this is related to the Fed. Once again correlation is not causation. The concentration of capital is a phenomenon inherent within capitalism itself. The Fed has made this argument, its claim is false. Other central banks in the world do not do this. There is no need for quotation marks; this is how the bank operates. This literally has nothing to do with the Federal Reserve. Capital concentrates in ALL capitalist systems and sectors, banks are not immune from this effect. This is a complete non-sequitur. The Federal Reserve is not supposed to regulate derivatives; the Commodity Futures Trading Commission and Securities and Exchange Commission have limited power to do so via the Dodd-Frank law. The Federal Reserve has no authority over derivatives and isn’t supposed to. The source for this claim misrepresents how the Federal Reserve operates by leaving out information which I think the authour just isn’t aware of. He literally says: “That is why I call the Federal Reserve a perpetual debt machine.” This is his opinion, one that is shared by many, but it is an opinion. National debt is the result of deficit spending by political actions. It is not controlled by the Federal Reserve. This is correct, but not related to the Federal Reserve. #24According to Article I, Section 8 of the U.S. Constitution, the U.S. Congress is the one that is supposed to have the authority to “coin Money, regulate the Value thereof, and of foreign Coin, and fix the Standard of Weights and Measures”. So exactly why is the Federal Reserve doing it? The only countries in the word that are not members of the IMF are Cuba, North Korea, Monaco, Andorra and Nauru. Monaco, Andorra have no central bank, while Nauru is a part of the Asian Development Bank. Cuba and North Korea have central banks and they are not a part of the IMF. This post makes it sound like (as well as many libertarians claim) the IMF forces central banks on people. Or that somehow central banks are permanently linked to the IMF. This is not the case with Cuba and North Korea. It’s often claimed by such people that the IMF is a socialist conspiracy to force all countries under one bank. Yet the socialist countries are not members of the so-called one world government bank. Interestingly, the Soviet Union applied to be a member of the IMF, but only on the eve of its planned dismantling and conversion to capitalism. In addition, it says that “the Fed is at the very heart of our economic problems.” This literally removes any investigation into the economic system that exists and places blame entire on a single entity. Doing this effectively claims capitalism is a perfect system that can’t have any flaws. This cult-like mentality towards the free market demonstrates the shear ignorance of the Infowars crowd. It largely applies to libertarians as well, as their beliefs are the same in this regard.